This is 'Napa at Sunset' by Deb Karasik, 2005. She was a challenge to me to use colors I was not comfortable with, and try piecing techniques I'd never tried before. I never thought I'd finish...but I did, and she surprised me with a Second place ribbon at the Marin County California Quilt and Needleart show. Who knew? 'Napa at Sunset' has been one of my most requested patterns. Originally available only on the pattern CD-Rom included with the 2nd Edition of Quiltmavens: Perfect Paper Piecing by myself and Janet Mednick. The directions are reprinted from the original CD-Rom. The pattern's pieces are now pre-printed full size on my exclusive Perfect! Paper Piecing Paper. This means that no copying or taping together of pieces is necessary, simplifying assembly. 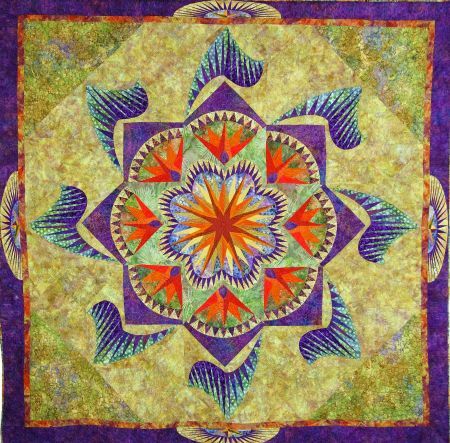 "Napa at Sunset" is an advanced project recommended for experienced paper piecers.